No menus appear for mod_product_categories VirtueMart. You install your VirtueMart mod_product_categories to have a nice drop down or flyout VirtueMart Categories menus but the only menu you can get to show is the simple list! You install your VirtueMart mod_product_categories to have a nice drop down or flyout VirtueMart Categories menus but the only menu you can get to show is the simple list! Having seen this many times in forums I'll put it here so hopefully the solution will be a bit easier to find. 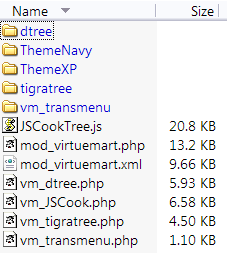 Even though many of the calls to JSCook Menu etc are to the includes/js/JSCookMenu.js etc there are also a lot that are to the a group of files that are installed with the base VirtueMart module. You can find this in the modules folder of the standard VirtueMart install. So install this and it will install the necessary files. 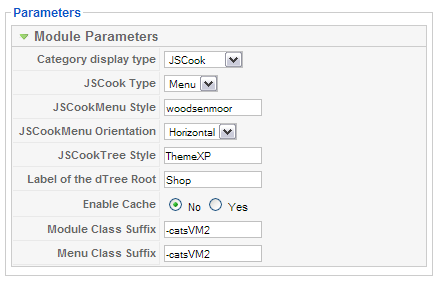 Now when you select JSCook, TigraTree etc they will display.